which means I offer butter and the rice made out of kaara arisi bless me that i live happily with my husband. Neivadhayam is made of banana leaves Neivedhyam consists of Adai made out of rice and butter, and adai made of rice and jaggery also, along with butter kept seperately.Vethalai paaku pazham is also offered to the Goddess . The women in the family perform Naivedyam (offerings to the divine) after placing a Karadai in a plantain leaf with betel leaves, areca nut (betel nut) and a ripe banana in front of the idol of God. 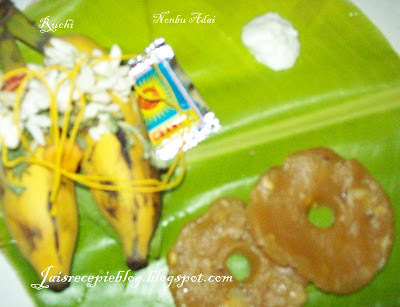 A Charadu (sacred thread) with a flower tied to it like a pendant (in a necklace) is also placed along with the offering. A small quantity of butter is placed on the adai and offered to the gods. While offering the women chant, ‘urukkadha vennaium oradaium vaitthen, orukkalum piriyamal en kanavan irukka‘ which is essentially an entreaty to God to grant her husband a long life. After finishing the pooja, according to one’s custom, charadu should be tied around the neck. 2. Roast the Moong dal also to a golden red colour. Cook the Moong dal with just enough water, until half done. Add the jaggery in 2 cups of water. 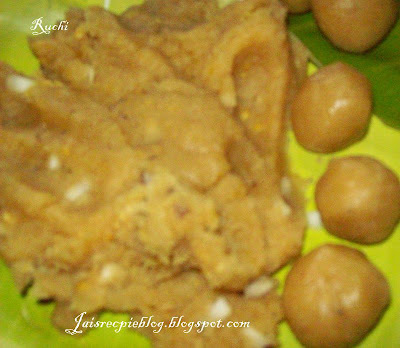 3.When the jaggery is melted add the half cooked Moong dal, coconut gratings, and roasted rice flour and cook until all the water is absorbed . 4.Add the cardamom powder and the ghee, stir well till every thing together cooks well to form a thick paste. Remove from fire and allow to cool. 5.When reasonably cool, roll the cooked flour into balls. Take half of the balls and flatten in the form of adais on plantain leaves. 6.Make small pieces of plantain leaves. Make small balls of the cooked rice flour (the size of a small orange) and keep on the plantain leaf. Flatten with the palm and make a small hole in the centre. 7.Keep the plantain leaves on a steamer and steam for 5 to10 min. This is offered with a blob of butter. 1.Roast the rice flour and moong dal separately to a golden brown colour. 2.Cook the moong dal in just enough water, until half done. Heat the oil in a pan and add the hing. 3.Add the mustard. When mustard starts spluttering, add the urad dal, green chillies and curry leaves. 4.Add 2 cups of water, salt to taste and the coconut gratings. 5.When the water starts boiling add the half cooked moong dal and rice flour and cook until all the water is absorbed. Allow to cool. 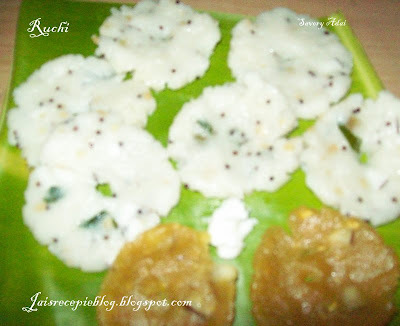 6.Make balls of the cooked rice flour and flatten on plantain leaves and steam for 10 mnts. On this occasion let me wish all the ladies a happy karadayan nonbu! We to celebrate karadayan nonbu! Adais look perfect,we make kozhukattais I think! This is a very nice post . Looks so authentic. Its always a pleasure to worship Gods on auspicious days with their favorites. Very informative. I Love to celebrate this function.